You should know people, don’t just go around messing with anyone! We have freedom of speech but please, sometimes keep your remarks to yourself. Celebrities are human beings, flesh and blood and they too need the ‘freedom’ to enjoy life. Sometimes we always set a high ‘SI Unit’ for them but that ain't fair. Yesterday, one Elvs Nakhungu ‘kissed’ a bee and he was with no doubt ‘stung.’ Truly, hell has no fury like a woman scorned! 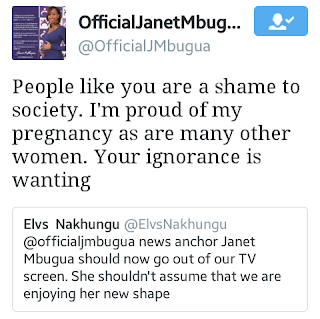 The sassy and classy news anchor had to give Elvs a dose of his own medicine after Elvs claimed that Mbugua should stop anchoring news due to her pregnancy. He went further and said that viewers are displeased with her new shape. Janet Mbugua Ndichu, who currently has a huge baby bump decided to teach the ill-bred nincompoop some manners. I think she is beautiful and she should go on with her work we are not looking for her shape.she is proud to be pregnant.big up Janet.